The National Curriculum has changed in England, causing a mixed response from parents. For those who have children who take naturally to numbers, the change in the requirement for the number children should be able to count to by the end of reception year from 20 to 100 seems like a better goal. When you have a pre-schooler who can already count to 20, that being the goal by the end of their first year at school can seem limiting. However for a huge number of kids who are struggling with the basics, a goal of 100 is a lot of stress at an age when the focus of education should perhaps be on gaining confidence, interpersonal skills and self care. So what can you do to support gaining literacy and numeracy skills in a way that won't cause stress and in a way better suited to small children's development needs and abilities? 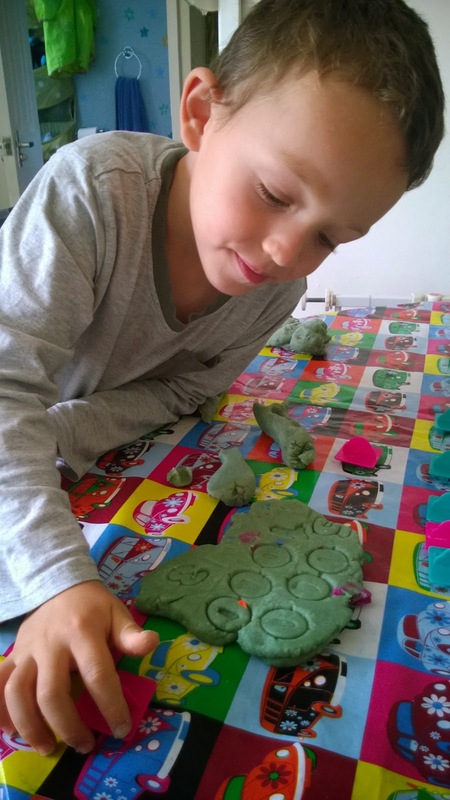 One fantastic medium for play that I have written about before is play dough. It is easy, cheap and fun to make and can be used for an endless array of play learning. A fantastic medium in itself for developing fine motor skills, add in colourings and scents and you have a dough that stimulates several areas of the brain as it processes the texture, colour and smell of the dough. For kids of Toby's age (2) the experience of trying out plastic scissors, rolling pins and cutters all helps to develop the muscles in his hands and the dough offers a great material for creative play. For older children like Ollie (4) this play can also be guided into playing number, letter and word games. Start children off by helping them to model the first letter of their name, then perhaps their whole name, or another word they want to make. Ollie is currently fascinated with working out what letters are in words, and reading what words say. In the picture he has made the word 'cat'. You could do the same with number characters - again starting with something relevant to them such as their age. By creating 3D shapes of number and letter characters you are doing three things. The first is that by sitting with your child and playing with them you are making them feel good about themselves. Nothing is more precious to your child than your time - even if it's the half an hour after work and before bedtime, this time spent focusing on them will be their favourite part of the day. 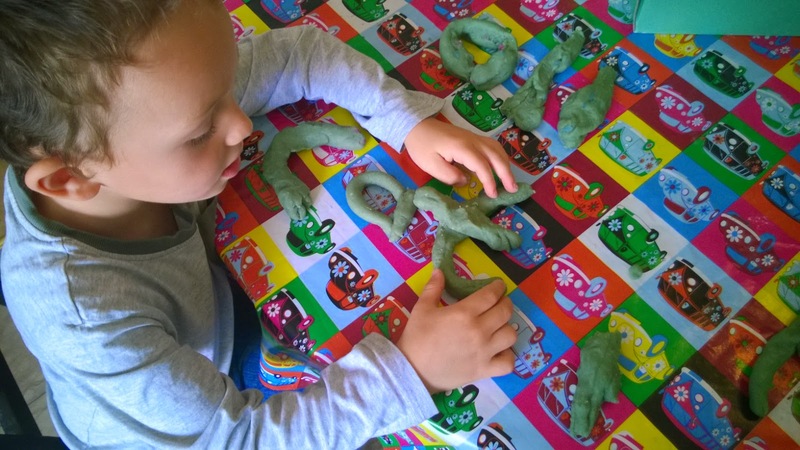 The second thing is that you are making learning into a game and introducing letters and numbers without coercion and stress "hey look, I made an 'm' for 'mummy', can you help me to make an 'o' for 'Ollie'". Lastly, presenting numbers and letters in different formats helps to cement the recognition of their shapes - written on paper, printed in a book, seen on an educational show like Numtums, printed with a stamper, written in glitter on card, made out of sticks - the more your little one is exposed to the shapes the better chance they have of becoming familiar with them. For the thousands of children with dylexia and visual stress this hands on play approach is especially helpful. Anything that you can make into a game helps to prevent the mental block that kids often develop when learning is made too serious and either too boring or too hard. In our dough printing game Ollie stamped out numbers for me to read to him - when Ollie stamped out numbers over a billion he gave me a cheeky smile and said "that's how old you are mummy". In the picture he is finding out how adding zeros changed the value of the number from 5, to 50, to 500 to 5000. Dough can also be used to introduce the basics of addition, subtraction and division - make little balls to count and add etc... Division can be taught by playing at cafes with play dough pizza "I'd like to buy half a pizza please", "there are three of us so we need to divide this pizza by three to make thirds"... I introduce this language well before I expect them to be able to understand the concepts just as part of everyday speech and as a result they develop the understanding without really noticing they are doing maths. Never say "No that's wrong" as they will become afraid to try - say "almost there, we just need to ..." instead. Finally a note on the pace of learning. It can feel like a competition when people tell you what their kids are doing, but the goal of this play learning is principally just to have fun with you little ones. Ollie was fairly early with some of these skills, but other friends have kids who were counting earlier, or later, and it really doesn't matter so long as you are supporting them to progress at their own pace. The aim of play learning is to provide opportunities for learning as opposed to having a list of what they 'should' be doing by a particular age. 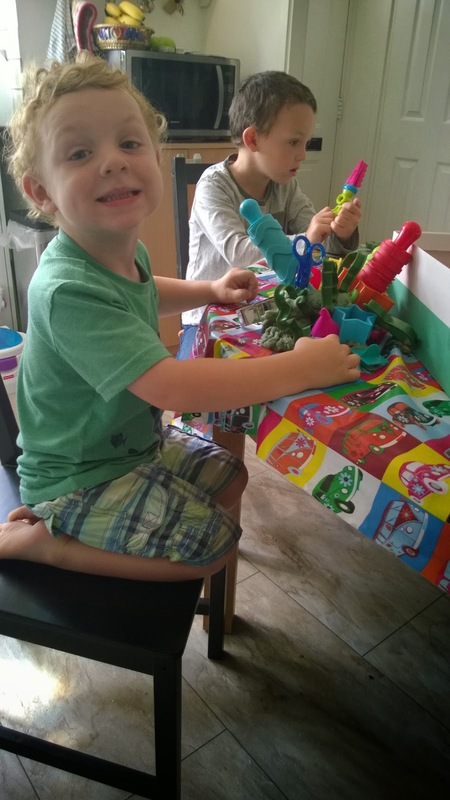 If your little one wants to stop looking at letters and make a play dough rocket, then go with the rocket. Little and often is the key to learning any new skill. If you have kids already at school who are struggling, don't be afraid to go back to playing with the basics and make sure they have firm foundations to build the trickier stuff on. If the basics are missed, everything else becomes impossible. I listened to a colleague at the 6th Form College (where I taught A-Levels) trying unsuccessfully to explain to a 16 year old resitting her maths GCSE that 10 divided by 5 was 2. Even when the teacher brought out 2p coins to help make it more visual the youngster still couldn't grasp it. Not every child is going to grow up to be friends with advanced mathematics, but we should be sending each and every one of them out into the world with the ability to work out if they've got the correct change in a shop, and starting early with playing with numbers is a great way to get this basic life skill embedded. colours and food flavourings as you want - turmeric, cinammon, jelly crystals, peppermint essence, lavender oil are all fun choices - I've also seen sand and glitter added but I don't like the texture. Safety - keep littlies away from the stove when you're cooking the dough. Avoid them eating it too as the salt is bad news for small children.